Imphal: Expressing the need for women empowerment through innovative use of technology built within institutional arrangements, Governor of West Bengal, Shri Keshari Nath Tripathi strongly emphasised that women need to be brought into the of mainstream of national development. Inaugurating the 7th Women Science Congress at the ongoing 105th session of Indian Science Congress in Imphal today, Shri Tripathi pointed out that representation of women in science and technology is less than expected. He added that proper education, motivation and maximisation of human resources are the need of the hour. “Women empowerment may be through innovative scientific activities and integrating action-oriented literacy. 7th Women Science Congress is a significant step towards nation-building”, Shri Tripathi stated. In his keynote address, Vice Chancellor, Prof Adya Prasad Pandey said that women can not only prove to be good scientists, they can light the lamp of knowledge in the family as well as the society. 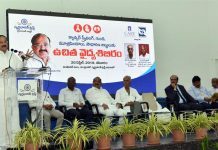 Shri Pandey said that reaching the unreached through science and technology means reaching those areas which have not been reached, as well as those areas of research where not much work has been done. Speaking on the occasion, General Secretary, Indian Science Congress Association, Prof P.P Mathur expressed the view that participation of women in the field of science and technology must increase. He underlined the need to frame guidelines to increase the participation of women. Representing the Ministry of Science & Technology, Scientist ‘F’, Smt. Namita Gupta pointed out that the Ministry has launched the India-US Fellowships in December 2017 to encourage research by women in the field of science and technology. The Governor of West Bengal also released a souvenir of Women Science Congress on the occasion.